Guardi's view of the Rialto from the Grand Canal is an impressive example of the cityscape that is one of Venice's great contributions to our visual experience. The Rialto was one of the busiest intersections of the city, as the bridge was the only one spanning the Grand Canal until the middle of the nineteenth century. Looking south toward the Rialto is the Riva del Ferro, at right, and the Riva del Vin, at left, where barrels of iron and wine, respectively, were unloaded. The flickering white highlights create an agitated rhythm that, when combined with the almost abstract patterns of broken colors in the buildings, transforms an actual view into a vision of glittering, ever-changing life. J. T. Payne (sale, London, Christie’s, 1879). [Martin Colnaghi, Guardi Gallery, Haymarket, London]. 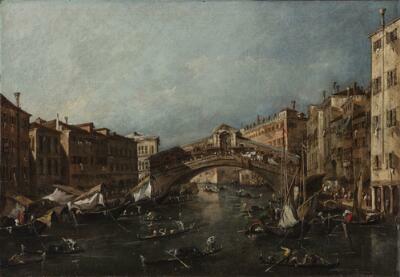 Painting for foreigners was a main source of Francesco Guardi’s livelihood. This View of the Rialto, Venice, from the Grand Canal must have been quite popular, because Guardi painted it numerous times. The vigorous commercial life of this bridge, the only span over the Grand Canal until the middle of the 19th century, is not described with an eye to realistic detail. Rather, Guardi gives us the sensation of the bustling canal by capturing fleeting moments with quick dabs of paint—gondoliers rowing from one bank to the next, boats at the left crowding the Riva del Vin to load and unload barrels of wine, tiny people in the distance, strolling across the bridge. And what better way to suggest the transitory than through the act of painting: Guardi painted with a rapid, spontaneous and lively touch using a small, fine brush. His flickering white highlights lead our eye rhythmically along the canal, and he animates buildings and water with shifting patterns of light and shadow.